Client, Status, or Type. You can edit, disable, re-enable, and delete reminders. There are also options to restrict the date range and perform a search for a specific word or number. The listing will change to match any filters that you apply, and you can combine several filters to make your report very specific. To clear away any filter, you can perform a reset at any time. You may access this feature by choosing SMS Campaign > Reminder from the toolbar. Don’t forget that you can access the SMS Campaigns and features by utilizing the quick link icons that are located under the toolbar on the Dashboard. On the left side of the report control panel, you’ll find a group of filters (below). Choose from one or more of these drop-down menus to filter by Client, Status, or Type. Click the From calendar icon (for example, enter 4/1/2012). Next, click the To calendar icon (you might enter 4/30/2012). Disable – Click this icon to disable the campaign. A disabled reminder cannot be used again until it is enabled. Delete – click this icon to delete a reminder. A deleted reminder is both disabled and invisible. The figure below displays the first few column headings. Underneath these headings, you will see a list of all your reminders. Click this icon to edit the reminder (you will exit the Reminder Manager). Click this icon to enable the reminder. Click this icon to delete a reminder. A deleted reminder is both disabled and invisible. The Date Reminder feature allows a user to send a text message on a specific date that matches a date value found in a database record. This date can be in any date field in the entire record. Optionally, you can send the message at a custom interval that is either before or after the date. Access this feature by choosing SMS Campaign > Reminder > Date Reminder from the toolbar. Click the Client drop-down list. Enter a Name for the reminder. Choose one or more databases from the Database listing. Click the plus sign (+) to move the database name to the Selected listing. Choose the Field in which you want to look for matching dates. For Day(s) Before / After, enter the number of day(s) before-or after-the message is to be sent. If you want to send the message prior to the matching date (found in the Field column), then select the minus sign (-). To send a message after the date occurs, use the plus sign (+). By default, the message will be sent once annually-which is especially effective for anniversary dates. Remove the check from Yearly Recurrence if you do not want the message to be sent every year. Choose the Send At time. This is the precise hour of the day at which the message will be sent. If you want to conform to the time zone that is found in the database record, then choose Yes in the dropdown for Adjust to Record Time Zone. The Database Reminder feature is a tool for distributing simple SMS reminder messages. Read below to see how easy it is to setup. 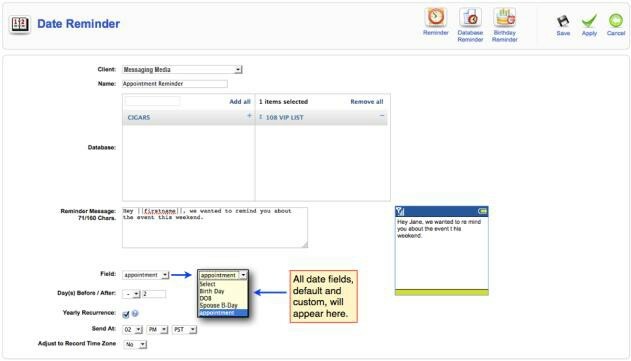 To choose a Database, click the database name in the Available listing, then click the right arrow to move the database name to the Selected listing. In the Reminder In field, enter the number of days that will elapse until the reminder message will be sent. 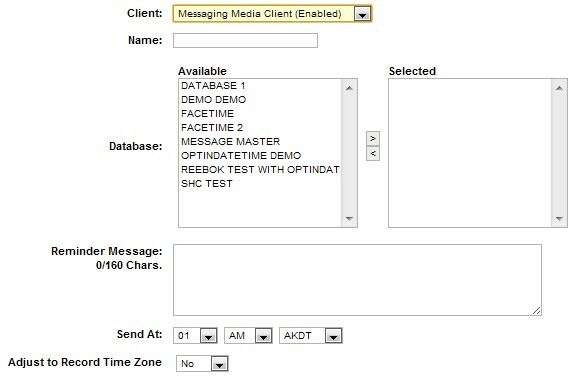 Optionally, for Send At, choose the precise time at which you want the reminder to be sent. 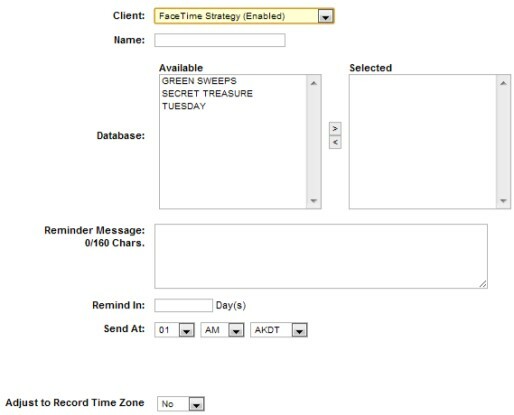 Choose No for Adjust Record to Time Zone if you don’t want the reminder to account for the time zone in the recipient’s record. The Birthday Reminder feature is a tool for distributing SMS birthday reminder messages. Unlike the Database Reminder, this reminder examines the Date of Birth birthday field in the recipient’s record. Read below to see how easy it is to setup. You may access this feature by choosing SMS Campaign > Reminder > Birthday Reminder from the toolbar.